OVER 400,000 PEOPLE HAVE BEEN KILLED! In an effort to promote awareness and raise funds for the women in Darfur, Song of the Lorelei Productions will produce a DVD presentation about their current GENOCIDE CRISIS! Over 400,000 people have been KILLED. Despite a recent peace agreement, the militia's attacks, rapes, and torture of the displaced in Dafur continues. 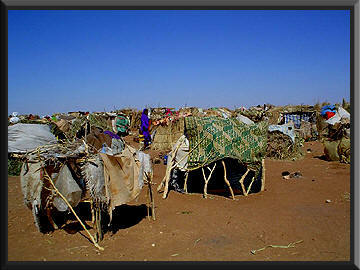 Over 2,500,000 people have remained displaced in refugee camps like this one. Many politicians including our supporters Congresswoman Diane E. Watson, and Nancy Pelosi, along with numerous celebrities have lent their names and their time to making this a front page issue! There is still a great deal of follow through to be done. Funds we raise will go directly to the Non Governmental Organization Zenabe, based in the Sudan. This group was chosen by The United Nations, and they are a trusted NGO, prepared to distribute supplies and funding where they will most benefit the displaced citizens of Darfur. 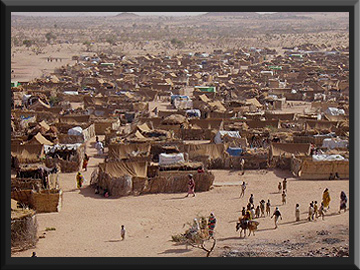 A refugee camp in neighboring Chad, also in the Sudan. (C) 2011 Song of the Lorelei Productions Inc.